This dead ringer for the Jorno shares its twin's same flaws, though. 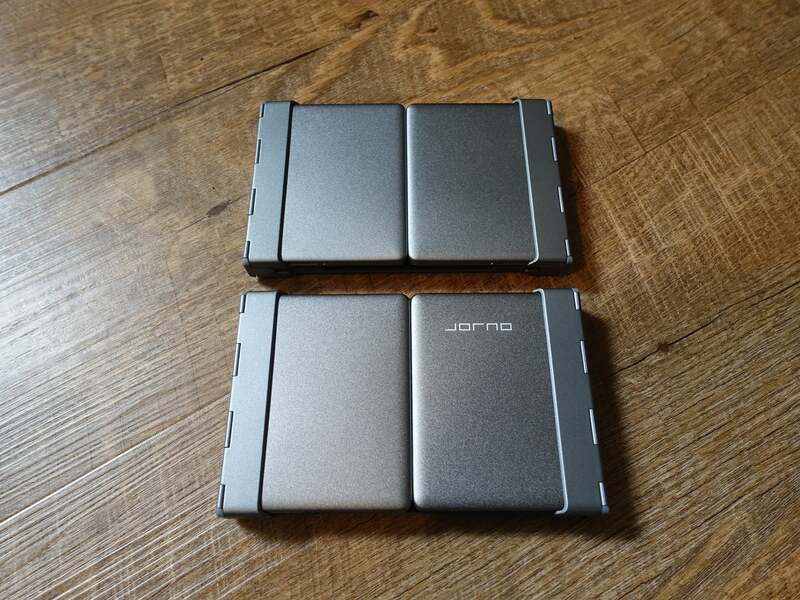 Which came first: The Jorno or the $33 EC Technology Foldable Bluetooth keyboard? It’s a chicken-or-the-egg sort of deal. If you care about this question, you likely invested a good sum of money in the Jorno Kickstarter campaign. 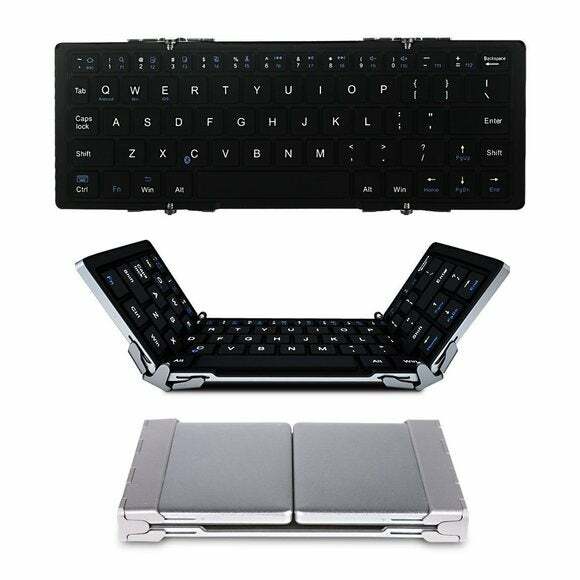 Who wouldn’t be steamed about forking over their hard-earned cash for a folding keyboard that can be had elsewhere under a different brand name, for a lot less money? The differences between the Jorno and the EC keyboards are so minor, it’s unlikely most people will tell them apart at a glance. Like the Jorno, the EC Tech keyboard measures 9.91 x 3.53 x 0.26 inches fully deployed and 5.77 x 3.53 x 0.67 inches in size. The EC’s construction is nearly identical too: Aside from a lack of the rubber feet that keep the Jorno from sliding around during use, I couldn’t see or feel any difference in construction or materials between the two keyboards. That’s a good thing: The Jorno and EC Tech keyboards’ matte-grey anodized aluminium exteriors are tough, keep the hardware’s weight down, and look great. 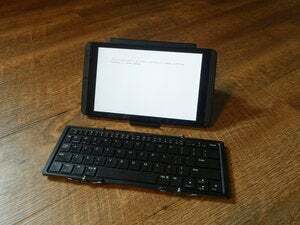 The EC Tech is a dead ringer for the Jorno in multiple other ways, too: The power and Bluetooth pairing lights at the top of the EC Tech keyboard are identical to those on the more expensive Jorno. The hardware weighs the same and its battery life, as near as I could tell through testing, lasts for the same amount of time. It should come as no surprise then that, after a few hours of typing on the EC Tech keyboard, I became frustrated with it for all of the same reasons as with the Jorno. So yeah, if you’re a touch-typist or a hunt-and-pecker that has fingers the size of Snickers bars, you’ll hate this thing just as much as you’ll hate the Jorno. With all the similarities between the EC Tech keyboard and the Jorno, let’s talk about what’s different. First, you don’t get a case with the EC Tech. The Jorno comes with a nifty one that transforms into a tablet stand. 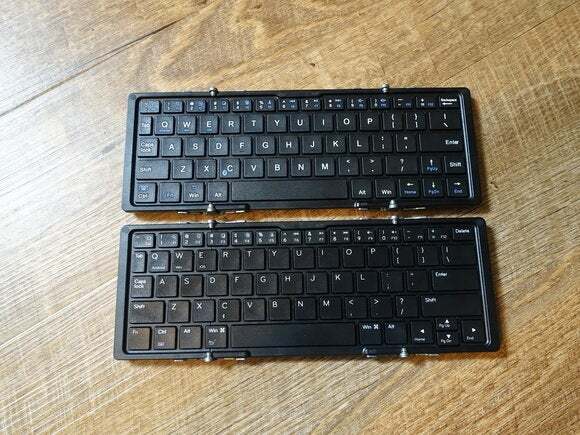 If you can live with that, or already own a tablet/smartphone stand that you like, you may as well get the EC Tech keyboard instead of the Jorno. Then, with the cash you saved, buy a hot dog and drink to celebrate your financial victory. It is possible to buy a stand separately for $9. But buying the EC Tech plus a case would cost you about two bucks more than ordering a Jorno through Amazon, so you may as well buy the Jorno if you need more than just the keyboard. Though the key layout and typing experience on the EC keyboard matches that of the Jorno, the labeling on the two keyboards differs. Either will allow you map their keyboard to work with Android, Windows, or iOS, but only the Jorno’s keys have the shortcut iconography for all three operating systems stamped on them. The EC keyboard offers the visual cues for just a limited number of Windows and Android shortcuts. If you’re an Android or Windows devotee, the lack of Apple icons might not matter to you—but if you end up switching to a piece of iOS hardware down the road, it could prove irritating. Should you buy EC Tech’s keyboard or get a Jorno instead? Honestly, aside from their build quality, I’m really not crazy about either. While each keyboard has a great feel with a satisfying amount of travel, the spacing between the keys and the size of the keys themselves make it difficult to type accurately at speed. I say this as someone used to working on an Apple Wireless keyboard and a Logitech EasySwitch keyboard nonstop for hours per day. I can’t imagine how frustrating using the EC Tech or Jorno would be for someone who typically works on a full-sized desktop keyboard. That said, if you’re specifically looking for a Jorno replica and don’t need a case, you can save a few bucks with EC Tech’s keyboard. 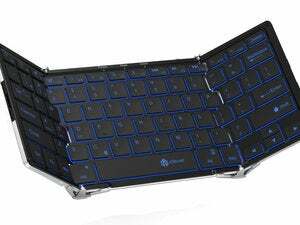 If you want a Jorno but don't need its case, EC Technology's keyboard is a clone that's a few bucks cheaper. However, as a dead ringer for the Jorno, it also shares both its perks and its downsides.